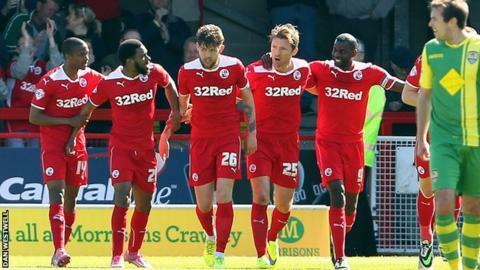 Crawley moved out of the League One relegation zone with a comfortable win against fellow strugglers Notts County. Kelly Youga's overhead-kick from Anthony Wordsworth's corner put the hosts ahead, before Darren Ward nodded in a Wordsworth free-kick soon after. Gary Jones twice came close to reducing the deficit, but keeper Brian Jensen made two sharp saves to deny him. The visitors struggled to test Jensen in the second half, as the Red Devils sealed a crucial three points. Notts County are two points adrift of safety and are still searching for their first win under new manager Ricardo Moniz. Crawley, meanwhile, are now three points clear of the relegation zone, although both 21st-placed Leyton Orient and 22nd-placed County have a game in hand. "We scored two great goals from set plays that we've practiced. "We used the conditions, the wind was blowing down the pitch so Anthony Wordsworth delivery into the box was good and we got 2-0 up. "We managed the game really well and we could've scored probably five or six more. "We didn't make any mistakes and on the counter-attack we looked dangerous but we didn't finish off the chances." "It is not the first time that we have conceded so easily. We brought them into the game, if we analyse how many chances they really created it was not very many. "We brought ourselves the problems. First goal we don't mark, two individual mistakes from set pieces. "It was to be expected we don't create as much the moment Jamal is injured. You saw against Yeovil where he changed the game because of individual skill and speed. But really even in the first half we didn't create enough chances and that is down to individual class." Match ends, Crawley Town 2, Notts County 0. Second Half ends, Crawley Town 2, Notts County 0. Alan Smith (Notts County) is shown the yellow card. Anthony Wordsworth (Crawley Town) wins a free kick in the defensive half. Foul by Alan Smith (Notts County). Corner, Notts County. Conceded by Lanre Oyebanjo. Substitution, Crawley Town. Lanre Oyebanjo replaces Gavin Tomlin because of an injury. Corner, Notts County. Conceded by Sonny Bradley. Attempt blocked. Alan Smith (Notts County) right footed shot from the right side of the box is blocked. Attempt missed. Gary Jones (Notts County) right footed shot from the centre of the box is close, but misses to the right. Corner, Notts County. Conceded by Gwion Edwards. Attempt missed. Dean Morgan (Crawley Town) left footed shot from the centre of the box is close, but misses to the left. Attempt saved. Izale McLeod (Crawley Town) right footed shot from the centre of the box is saved in the bottom right corner. Substitution, Crawley Town. Dean Morgan replaces Mathias Pogba. Izale McLeod (Crawley Town) wins a free kick in the attacking half. Foul by Jordan Williams (Notts County). Lewis Young (Crawley Town) is shown the yellow card. Graham Burke (Notts County) wins a free kick on the left wing. Substitution, Crawley Town. Gwion Edwards replaces Josh Simpson because of an injury. Corner, Notts County. Conceded by Lee Fowler. Substitution, Notts County. Curtis Thompson replaces James Spencer. Foul by Josh Simpson (Crawley Town). Hayden Mullins (Notts County) wins a free kick in the defensive half. Attempt saved. Izale McLeod (Crawley Town) right footed shot from the left side of the box is saved in the centre of the goal. Attempt missed. Izale McLeod (Crawley Town) right footed shot from a difficult angle on the left is too high. Corner, Notts County. Conceded by Izale McLeod. Attempt blocked. William Hayhurst (Notts County) left footed shot from outside the box is blocked. Foul by Sonny Bradley (Crawley Town). Attempt missed. Izale McLeod (Crawley Town) header from very close range is close, but misses to the left. Darren Ward (Crawley Town) wins a free kick in the attacking half. Attempt blocked. Izale McLeod (Crawley Town) right footed shot from the right side of the box is blocked. Substitution, Notts County. William Hayhurst replaces Blair Adams. Attempt saved. Graham Burke (Notts County) left footed shot from the left side of the box is saved in the bottom left corner. Second Half begins Crawley Town 2, Notts County 0. First Half ends, Crawley Town 2, Notts County 0.